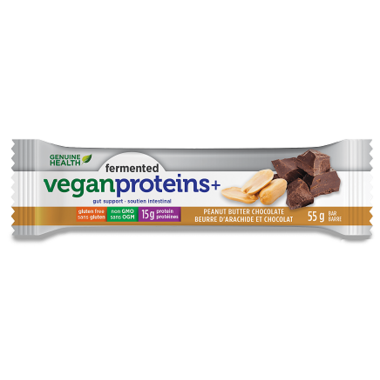 Genuine Health Fermented Vegan Proteins+ Bars offer a quality vegan protein powder bar that harnesses the power of fermented foods in a convenient and delicious format! 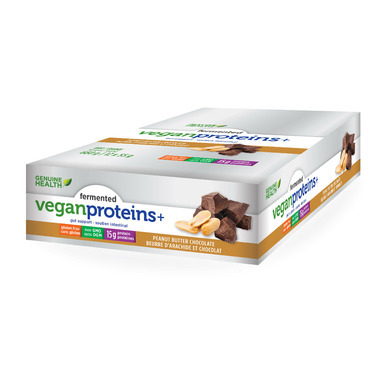 With advanced digestive support, Genuine Health Fermented Vegan Proteins+ are high in protein with 20 g of fermented dietary protein per serving. It's the first fully fermented protein which contributes to a healthy gut, overall good health, and is easy to digest. Genuine Health Fermented Vegan Proteins+ are non-allergenic, soy-free, and contain a balance of all essential amino acid. These are seriously so delicious! Ive tried many vegan bars in the past that have terrible texture and a gross after taste. These are divine! These are great! Texture is chewy and the chocolate chips add a nice sweetness. Love that you can see full chia seeds on it too. Absolutely favourite protein bar hands down. I love the "rice crispy" crunch in them and the flavour is delicious. Also the fermented protein is much easier to digest and doesn't upset my stomach. Great for pre or post workout or a mid-day snack! It tastes like cardboard... The first bite you kind of taste a little peanut butter... but that's it. The rest tastes like cardboard... I ended up throwing it away. Never buying it again... The nutrition of this product is good, but the taste isn't. I don't get a lot of protein in my diet, so I was looking for a way to add some. I tried one of these on a whim from a drug store and really enjoyed it. So I was very pleased to find them on this site! They're nice and chewy, with no weird aftertaste, and are made with actual ingredients, and not chemicals! I'm not a "health food" person, I just like them - they taste good!